Today, it’s a spesh, as one of Velvet Sheep’s favourite bands the Band of Holy Joy have a new gig meets indoor all-day festival coming at the Bones & Pearl in London on Sunday 27th May, and we don’t need any more excuse than that to ask their ace front-person and poet for our ages Johny Brown to choose some killer tunes. 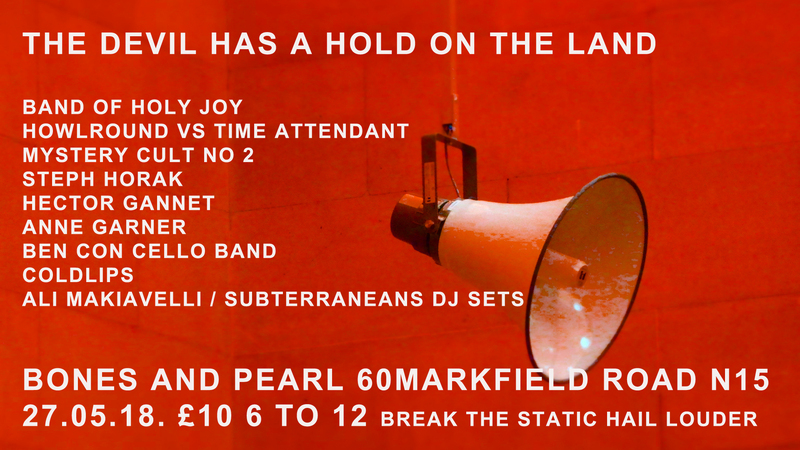 And even better than that, since the bill he and the Band are curating is sonically adventurous, ecclectic and also cos the maths works, it means Johny (and therefore the Sheep) can give props to the acts appearing at “The Devil Has A Hold On The Land” as it shall forever be known. Much like the Nightingales (label mates on Tiny Global), Band of Holy Joy are getting better and better with age, and their album “Funambulist We Love You” was Velvet Sheep’s album of the year last year. Johny and co have been back in the garage making a new album and I for one cannot wait. But in the meantime all (loud) hail thee, here’s the deets of the all-dayer that will satiate BOHJ needs, open your mind and free your soul. Still though we turn away from the impending dark clouds and the forecasted bitter winds and lose ourselves in memories of blue skies and happy days spent on the beaches and resorts of the North East with a pilgrimage to the Holy Island as a matter of course and faith. There is some great vintage footage of my mother winning the Miss Whitley Bay Marilyn Monroe Lookalike Contest of 1958 before she reverted back to the classic Elizabeth Taylor look, and if Anne Garner is a different kind of Northern Soul then Hector Gannett are Northern Folk as it is now and as it should be, fluid, forever changing, open to the future but with one eye always reverently on the past. I love this band and what they mean to me. Any Tyneside folk down in London, come check them out and support these fine fellows. The dark clouds of the future impinge themselves again with this unsettling audio sample of machine folk and Oh, this is some tale from the Black Tangle alright, listen to how the looped soundscape matches the genteel yet sinister terrain displayed, that seems to have echoes of both Hamlin and Belsen. Here it seems the devil has stolen the train and is leading us away from the green and pleasant land once and for all with no return to the pleasant times of yore, or have I simply misread the situation and is something more innocent afoot? I do know that Robin The Fog as Howlround is working his way right inside the ghost of the machine and conjuring up some of the most important sounds in modern music at present. We are honoured not only to have him on this stage with us, but also going head to head, toe to toe, sonic loop to sonic loop with the next chap. And now the Devil is on the land he shows effortless mobility as he drives us into a whole world of static and blip. Here the devil can be observed in his laboratory wearing an immaculate white Fred Perry shirt and sporting a cooler than you pair of Raybans as he puts us all into permanent loop repetition mode, wantonly experimenting with our minds and souls and bodies and banishing us all to a world of grey and grey static forevermore. The Time Attendant knows what’s been, he knows what’s coming. I love this video and the sound that TA makes. Kirsty Allison works full time in the Meep Factory for the Identity Capital but if she can get the time off work she will be joining us for The Devil Has A Hold On The Land. She is actually part of a new breed of poets such as Ana Sefer who are really nailing in words just what it is to alive in London at this hazily uncertain but beautiful crazy time of moments right now where evil has flowered rightly enough but it’s like seriously good fun and kicks, if you’re alive to it. Satan as a flower of light, the illumination in the night, watch her make it with her cold lips. She is Revolting aka Steph Horak’s incantation spells it out exactly how it is now; this world in the age of the Anthropocene. Lost Trees, Lost Words, Lost Worlds, Lost Minds, this is who we are, this is where we are at. I love this noise, this dirty spell-blinding glitch attempt to break the static spell on the land. Things are getting interesting now, things are getting dark, and out of the dark we see flickers of a beautiful other, glimpses of the future, as we strive to exorcise the ugly spirit, regain the beautiful nature, come and watch Steph use her body, her soul, her mind, her throat and tongue to break spells on the night. And now that the beautiful nature has been regained it is only fitting to end this selection with the charmed pagan mysticism of the Ben Con Cello Band who even when singing of winter manage to cast a great Pan like light over the land. Seen here in the Treppenhaus they are venturing over the North Sea from Hamburg to play for us, these three beautiful mythic fellows, for which we are honoured and delighted.